The Dead Sea is a unique, fascinating spot, popular with many tourists to Israel – as well as locals. There’s much more to Dead Sea holidays than just floating happily in the lake and rubbing one’s body with its mineral-rich mud. In fact, if you’re planning to travel to the Dead Sea there are so many points of interest around it. However, for those of you who for any reason only have time for a few days’ vacation, we highly recommend that you read this Dead Sea travel guide, which outlines many sights and activities to fit into a 3-day trip to the Dead Sea. First and foremost, you must plan how you will arrive to the Dead Sea. Several options are available – bus, taxi, or car (e.g., a rental car). A bus is the least expensive option. Buses to the Dead Sea leave from Jerusalem, Tel Aviv, Eilat and Be’er Sheva, but you must check their hours and frequency and plan your time accordingly. A taxi is more comfortable but also more expensive – however, if you share it with some friends, the cost per individual is not very high. The last option, which some may consider the most convenient, is driving by car – however, if you choose this option you should take care to drive slowly and carefully as the roads on the way are winding and occasionally feature steep inclines. The Dead Sea and the surrounding area offer various accommodation options, such as hotels, hostels, holiday villages and camping grounds. The style of accommodation you choose is largely dependent on your holiday preferences. If you like to be pampered on your vacations – with gourmet food (full board or half board), spacious rooms, luxurious beds, a swimming pool, a kids’ club, spa treatments, etc. – then you have your choice of hotels in the Dead Sea (simply check booking.com to find all options). If you’re only looking for a reasonably comfortable place to lay your head at night – there’s a variety of hostels you can choose from. Staying in hostels is usually a more social experience, giving you an opportunity to meet people from different parts of the world. Hostels either provide light meals or shared kitchen where you can prepare your food and eat with your friends. Holiday villages are an in-between choice – not overly luxurious but quite nice and offering plenty of facilities, with villas including a kitchen where you can prepare your own meals, and occasionally even a barbecue. And for the backpackers and adventurous souls out there – you can find several different camping grounds around the Dead Sea, some right on the shore, providing basic facilities such as electricity points, picnic tables, toilets and showers. Now that you’ve decided where you’re going to stay, it’s time to plan your trip! If you wish to feel like you’ve covered all the main Dead Sea attractions on your trip, you can use the following itinerary as your plan. Keep in mind that it’s just a suggestion – you can check off the list sites and activities that don’t appeal to you and add others, according to your tastes. Day 1 is the day of your arrival to the Dead Sea, so it’s only natural you’ll want to explore some interesting places along the way. The main road to the Dead Sea, Route 90, will bring you close to the Qumran National Park, where the famed Dead Sea Scrolls were discovered. The site includes a fascinating archeology collection which tells the story of the ancient village of Qumran, an archeological site where you can see the remains of village, and viewpoints from which one can see the Qumran caves and majestic landscapes of desert and mountains. The visitor center also offers a restaurant and a convenience store. Continuing south on Route 90 you’ll reach Ein Gedi – a beautiful natural reserve providing a rare green spot in an otherwise dry area. At Ein Gedi you have plenty of things to see and do: trek along one of its five walking trails (they’re quite challenging so it’s advisable not to do them in the summer or on very hot days), visit one of its streams and dip your feet in the cool water, explore ancient remains at the Chalcolithic Temple or the Tel Goren settlement, and more. You can dine at the nearby Ein Gedi Tavern, or pack yourself a picnic lunch and eat outdoors – just take care to leave the area as clean as you’ve found it. Both Qumran and Ein Gedi offer basic facilities such as parking areas, toilets and stores where you can buy snacks, bottled water, hot beverages, etc. If you’re staying at a hotel, you can pamper yourself at the spa and get treatments like a massage, a facial, a holistic treatment and so on. The Dead Sea is surrounded by high-quality spas, so even if you’re not staying at a hotel or your hotel doesn’t include a spa, you can find one a short drive away. A more energetic activity would be to visit one of Israel’s most famous historic spots – Masada. To get to the top of the majestic cliff and see the remains of the Masada fortress, you can take a cable car, or walk along the Snake Trail (a 30-minute uphill walk). At the site, you can walk around and explore on your own (the remains include the synagogue, the Byzantine church, the bath house, the water cisterns, the Western Palace and more), watch the spectacular audio-visual show and visit the museum. There are also amazing views to see – of the Dead Sea, the Moab Mountains and the Judean Desert. The visitor center offers a restaurant, a store, toilets and other facilities. There’s also parking in the area for those arriving in cars. 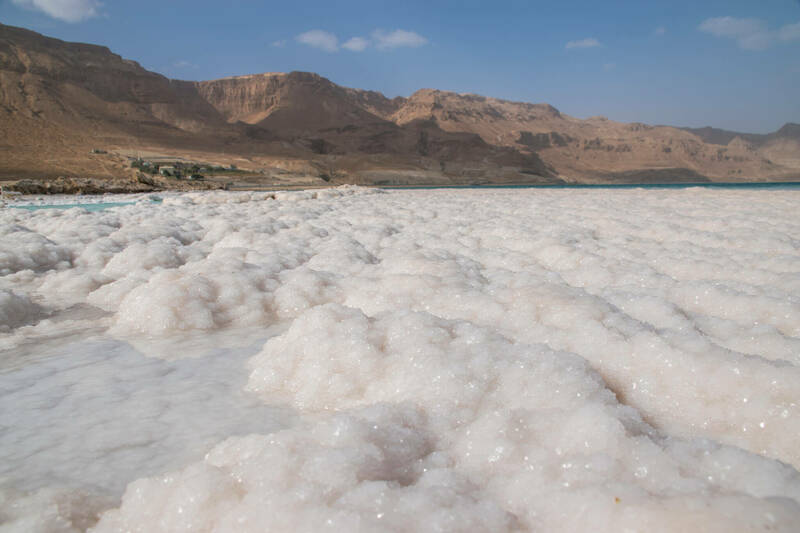 The final day of your trip is the perfect opportunity to bathe (or rather float) in the ultra-salty waters of the Dead Sea, absorb its beneficial minerals and smear some natural black mud on your body for an extra health boost – and entertaining photo-ops. There’s a variety of beaches you can choose from (ordered from north to south): Kalia Beach, Neve Midbar Beach, Biankini Beach, Ein Gedi Sea of Spa Resort, Ein Bokek Beach and Zohar Hot Springs Beach. All of them offer facilities such as toilets, showers, beach chairs, sun shades, lifeguard services and snack bars; and some also have restaurants, picnic areas and camping grounds. On your way back from the Dead Sea, if you have the time, treat yourself to some breathtaking viewpoints (depending on the direction you’re going). One great option is the Tank Hill viewpoint at the north of the Dead Sea, where you can see John the Baptist’s Monastery, Qasr-al-Yahud (a famous baptism site), Jordanian villages across the border, the Dead Sea valley and the city of Jericho. Another lovely stop is the Amir Viewpoint, not far from the Arava Junction, where you can see Mount Sodom, the Moab Mountains, the Valley of Tamar, the Dead Sea Works’ evaporation pools, the southern parts of the Judean Desert and Nahal Peres. We hope you enjoy your Dead Sea trip!